This quiche or gratin or whatever you want to call it is fast and easy to prepare. Keep it in your back pocket for a brunch or light supper and serve it with a green salad and a glass white wine. You are so elegant! Tweak it! You could use other vegetables (cook them first to soften them.) Vary the cheese: Gruyere, Gouda, Swiss cheese and Emmental are good choices, to name a few. Add chunks of ham or cooked bacon if you’d like to make it more substantial. 1. Center a rack in the middle of the oven and preheat the oven to 375ºF. Butter a 9-inch round ceramic baking dish or pie pan. Have on hand a baking sheet and a large strainer. 2. In a large skillet over medium heat, heat the oil. Add the onion and red pepper. Cook, stirring occasionally, for 6 to 8 minutes, or until the pepper and onion are wilted and soft. With a slotted spoon, transfer them to the bottom of the baking dish, spreading them in one layer. 3. Add the spinach to the pan and cook for 2 to 3 minutes, or just until wilted. If the pan is dry, add 1 tablespoon of water. Set a large strainer over a bowl and transfer the spinach to the strainer. Cool briefly and press out excess moisture with the back of a spoon. Spread the spinach on top of the pepper and onion. 4. Set aside 1/2 cup of the grated cheddar for the top of the pie, and spread the remaining cheese over the vegetables. Set the dish on a baking sheet. 5. In a medium bowl, whisk the eggs, egg yolks, salt and pepper until blended. Whisk in the cream. Pour the cream mixture over the filling in the baking dish and sprinkle the top with the reserved 1/2-cup cheese. 6. Decrease the oven temperature to 350ºF. Bake the quiche for 30 minutes, or until the top is golden and the center puffs but is still slightly wobbly. 7. Set the baking dish on a wire rack to cool for at least 30 minutes before cutting into wedges. Quiche can be served warm or at room temperature. It’s mud season around here. At least it will be soon. The snow is still piled high along the roads, but it is melting, every single day. Spring may be just around the corner, but our appetites are in winter. 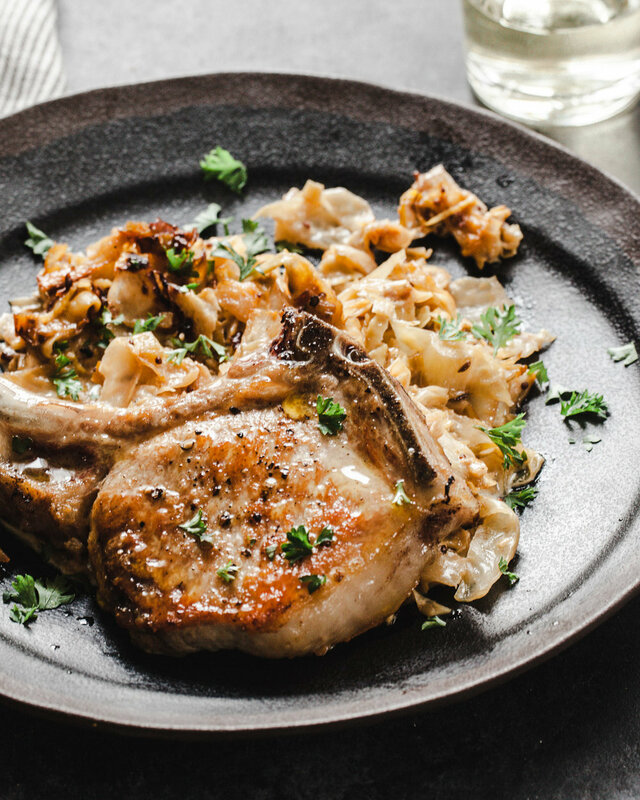 A warming dish of pork chops with creamy braised cabbage is on the menu while we wait. And wait. And wait. The technique of browning meat on top of the stove and then popping it into the oven to finish cooking is a favorite of mine, but it’s not just for steaks. A bonus to this method is that you can cook chicken or pork in the same way, and while you are at it, cook some vegetables (either on the stovetop or in the oven) to go with it. Here cabbage and leeks cook slowly in the same pan as the chops so they absorb all the good porky flavors. The flavors balance delectably: sweet cider and leeks melt into the cabbage and cream and the mustard ties them together with a little acidity. The meaty pork infuses all the elements in the oven. This is the supper to look forward to after your early spring walk when it’s still chilly outside. Eat well, be happy, friends! 1. Set the oven at 400 degrees. Have on hand a deep, heavy 12-inch skillet with a heatproof handle or a shallow flameproof casserole. Sprinkle the chops on both sides with salt and pepper. 2. In the skillet over medium-high heat, heat the oil. Add the chops to the pan and cook for 2 to 3 minutes on a side, or until browned. Transfer to a plate. 3. Pour off all but about 2 tablespoons of fat from the pan. Add the leeks and cook over medium heat, stirring occasionally, for 4 minutes, or until softened. Add the cabbage, cider, caraway seed, salt, and pepper. Cover the pan, turn the heat to medium low, and cook, stirring occasionally, for 30 minutes, or until the cabbage is very tender. 4. Stir the cream, grainy mustard, and Dijon mustard into the cabbage and bring to simmer. Taste and add more salt and pepper, if you like. Set the chops on top of the cabbage. 5. Roast in the oven, uncovered, for 10 to 12 minutes, or until an instant-read thermometer inserted into center of the meat registers 135 degrees. Let rest for 5 minutes. The pork will continue to cook as it rests. 6. On each plate, spoon some cabbage. Set a chop on top and sprinkle with chopped parsley. Slowly browned onions and tomato paste cooked for a few minutes in the bottom of the pot to turn it a roasty reddish brown give this soup tons of flavor. With carrots and celery added to the mix you don’t need stock to ensure the soup is tasty, not plodding. 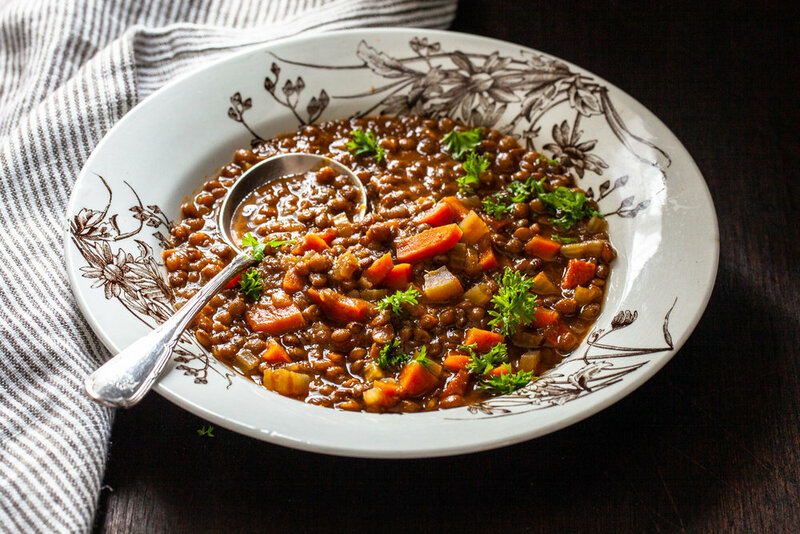 Since French lentils hold their shape during cooking, puree a little of the soup in the blender and add it back to the pot to give it some creaminess. The soup thickens as it sits, so you may need to add more water if you reheat it. 1. In a soup pot over medium heat, heat the oil. Add the onions and cook, stirring occasionally for 10 minutes, or until golden brown. 2. Push the onions to the side of the pot and in the space you made, add the tomato paste. Cook and stir for 2 to 3 minutes, or until the tomato paste darkens to a ruddy brown. Add the thyme, garlic, celery and carrots. Cook and stir for 1 minute. 3. Add the lentils, water, soy sauce, salt and pepper to the pot and bring to a simmer. Simmer for cook for 55 to 60 minutes, or until the lentils are soft. 4. Scoop out 2 cups of the soup and puree it in a blender until smooth. Return the blended soup to the pot and stir in the lemon juice. Taste and add more salt and pepper, if you like. Ladle into bowls and sprinkle with chopped parsley. Raise your hand if you want an easy, fast and delicious 30-minute weeknight meal. Topped with sautéed mushrooms, cooked with wine and a hint of smoky bacon, these chicken breasts just make life easier. The problem with chicken breasts (and everybody loves them) is that they are easy to overcook, thus making them dry; and truth: underwhelming. The key to cooking boneless chicken breasts without drying them is to brown them quickly in a skillet and let them finish cooking in the oven. A thermometer is your secret weapon to keep them tender and juicy. It should register about 165 degrees when inserted into the thickest part of the breast. Pancetta is essentially Italian bacon, but if you can’t find it, substitute thickly cut bacon for a similar result. Once you have the chicken out of the pan, cook the mushrooms in the same skillet to soak up all the meaty flavors. Your chicken will be ready at about the same time as the mushrooms. Dinner ready in under thirty minutes? I’ll take it. 1. Set the oven at 350 degrees. Have on hand a baking sheet or heatproof platter. 2. Sprinkle the chicken breasts with salt and pepper. Spread the flour on a plate and dredge the chicken lightly in it, shaking off the excess. 3. In a large skillet over medium heat, cook the pancetta, stirring often, for 3 to 4 minutes, or until golden. Transfer to a plate. 4. Turn the heat to medium-high and add the oil to the pan. Add the chicken breasts to the pan but don’t crowd them (do this in batches if necessary). Cook for about 2 minutes on a side, or until browned. Transfer to the baking sheet and place in the oven. Let cook in the oven for 8 to 12 minutes, or until a thermometer inserted into the thickest part of the chicken registers 165 degrees. 5. Meanwhile, add the mushrooms to the skillet and sear them without moving them for about 1 minute. Add a tablespoon of the wine to the mushrooms and scrape the bottom of the pan with a flat wooden spoon to deglaze it. Continue to cook the mushrooms for 3 to 4 minutes, or until they are golden. Add the remaining wine, lemon juice and rosemary to the pan. Continue to cook until much of wine evaporates, leaving some liquid in the pan for a sauce. Stir in the pancetta. Taste and add more salt and pepper, if you like. 6. Remove the chicken from the oven. Transfer the breasts to a platter and spoon the mushrooms and their juices over the top. Sprinkle with parsley and serve.